The holiday season is here, and a not-insubstantial part of the season for many of us is Star Wars. A new Star Wars movie, new Star Wars Legos merch to mournfully pass up on as I eye my holiday budget, and (tied for most blissfully with Rogue One) a new Star Wars: The Old Republic expansion. Knights of the Eternal Throne will arrive on December 2nd, sporting one of the most pivotal sequences in the SWTOR storyline yet, a host of new small dungeon experiences called Uprisings, a new metagame system called Galactic Command that weighs your decisions on a server-wide scale, and in general a whole lot of love for longtime and returning players. And did we mention playable Walkers? If it sounds like a lot, it is. Fortunately I was able to play through Chapter One and the Inferno uprising sitting next to none other than Creative Director Charles Boyd and Producer Ben Irving. 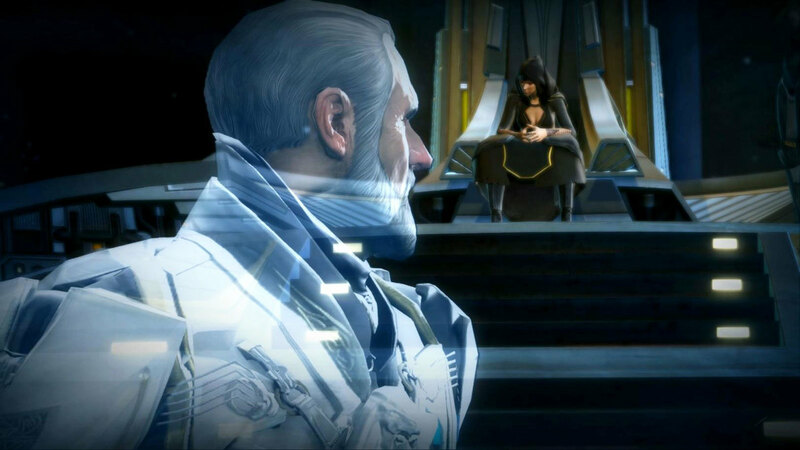 But first, it it has been a while since you’ve visited the Old Republic, I’m with you. I’d played on and off for the first few years of SWTOR and now, five years later, I felt a little lost. The cinematic trailer, while meaty, set up the current family drama in this act of our favorite space opera quite nicely, but a primer on the characters may be in order. At the start of Knights of the Eternal Throne, the Sith Empire has just undergone a change of power. Emperor Valkorion has fallen and his ruthless daughter Vaylin (star of the aforementioned trailer), accompanied by everyone’s favorite assassin-bot SCORPIO, now occupies the throne. Despite his death, the Emperor has his own plans which don’t include the homicidal Vaylin, and will appear to you in Force ghosty form in chapter one to help. Or possibly to hinder, we can’t be sure at this point. 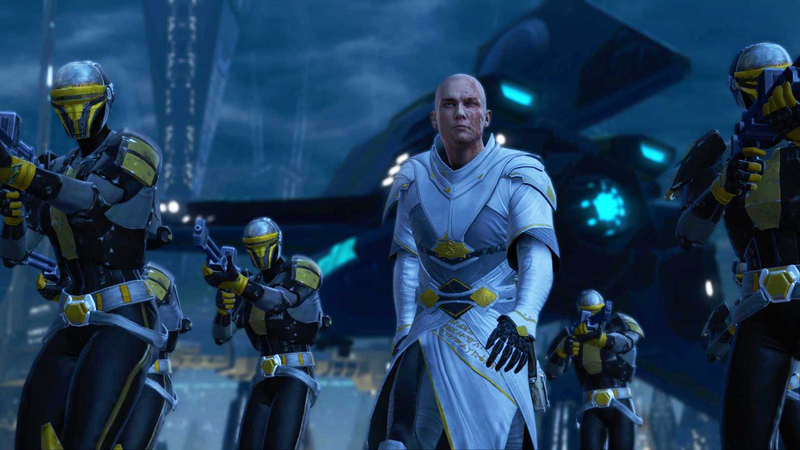 Vaylin’s brother Arcann is the wildcard in Knights of the Eternal Throne. He seems more Dark-sidey; during a ruckus with Emperor Valkorion, he was prevented from attacking by his brother Thexan and killed Thexan in a rage. Later he finished off Valkorion as well. But his mother Senya Tirall, a Force-sensitive member of the Imperial guard with whom Valkorion had a long romantic affair, won’t give up on him. 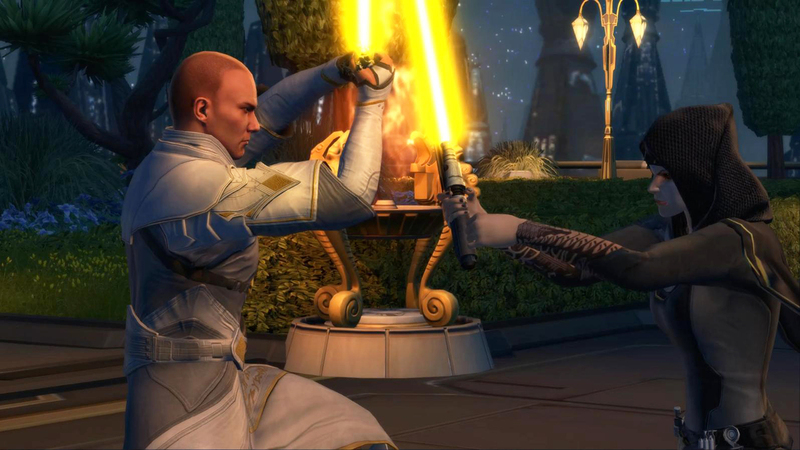 Continuing the Outlander storyline, you’ll get to decide whether Arcann becomes a sworn enemy or a troubled but true companion on your road to the Eternal Throne. If the family drama seems especially poignant on this week of US Thanksgiving, it’s meant to do so. I asked Creative Director Charles Boyd about why he delved so deeply into the family aspect when the player, in his or her role as Outsider, will never be claimed on the Emperor’s tax form. He explains: “It's just something that's core to so many things. If you have a huge family and have to deal with all the issues that brings - or even if you have never had a family, you still know what those things feel like. Chapter One begins on the planet Voss, where Vaylin (in typical Imperial fashion) has attacked an entire planet to root out Arcann and Senya. The Republic rushes to the neutral planet’s aid, and my level 70 Gunslinger Londilor was right there in the mix. After fighting alongside my Mandalorian NPC pals through globs of Skytroopers and buying the rest of the fleet time enough to arrive in the bargain, it was time to call in the heavy metal. The Rapid Recon Walker might not be a particularly elegant weapon, but as you’ve read, this isn’t exactly a more civilized age. Along with the piloted drone, the walker is a new vehicle that players can take for a spin in special story sequences. It has several unique abilities: single target (left-click) missiles, a gravity mine which draws enemies into a tight bundle, an area-of-effect mortar which deals nicely with bundled enemies, and stomp – useful for heavily armed and shielded enemies. While satisfyingly powerful, the walker isn’t a win button – pesky rocket troopers can shave chunks off your HP, and you’ll need to gauge when to use the amply placed green repair circles before you bite off more than you can chew. The boss fight at the foot of the temple where Arcann and Vaylin were holed up was particularly memorable – I dodged his death beams and eliminated the enemy walker moments before his spawnlings reduced me to a smoking hulk. Yet the shake-and-bake gameplay might have felt overdone if the sequence had gone on for more than twenty minutes or so, but it left me wanting more. About that. Will we see walkers elsewhere in SWTOR? A PvP Warzone Walker throwdown perhaps? “I would love to do that,” Charles laughed. “As soon as everyone in the studio played that sequence, it was like, 'Oh my gosh, we could do this here, we could do this here.' It gives you so many cool ideas." “Instead of adding new maps this time around, we spent more energy in redoing a lot of the classes, especially adding and rebalancing abilities, and changing focuses as far as class roles. Our hope is that when people re-play some of these maps, they're having a new experience because their class has new movement abilities, new AoE abilities, and the like. Back on Voss, we’d entered the temple and convened a family reunion of sorts. Emperor Valkorion resumed his role as force-ghostly interloper as Senya and Arcann came out of hiding to set the stage for perhaps the biggest decision of the expansion. Do we consider Arcann beyond hope, rotten to the core, consumed by the dark side? Should we seek to kill him, or seek to restore him to some shattered remnant of his former self? Each parent advocates for a different side of the question, and each has something to offer you. It’s a light side / dark side decision that will result in a powerful enemy or companion in the chapters to come. 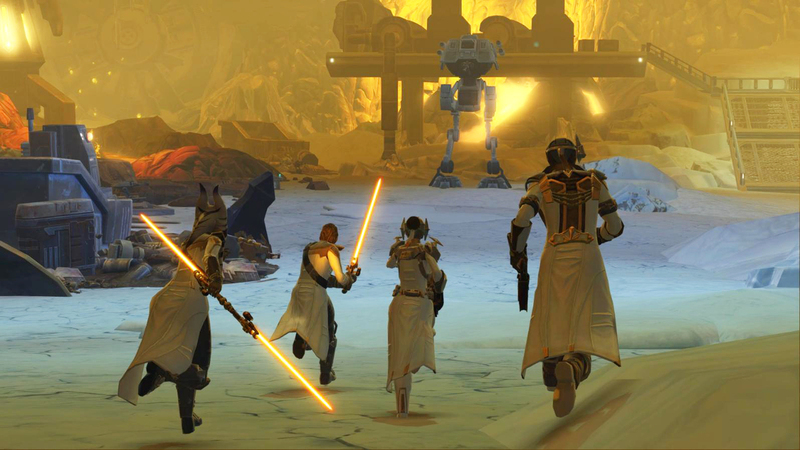 With Arcann’s fate sealed, press paired off into four person teams to tackle the first of five “uprisings” planned for release with the expansion. Uprisings are co-op dungeons meant to be tackled in a single playsession. All available uprisings will be listed in the new Galactic Command interface, and players can either bring their own full groups, fill out partial groups with companions, or queue up to join with random other players. The uprising we tackled, Inferno, takes place inside a Sith volcano base. Inferno featured plenty of ring battles and at least three boss fights (I only had time to dirt nap in front of the first, Lord Wrad, a couple times). Power-ups and one-use weapons were sprinkled liberally around the map, but a solid group with a good healer is probably a must. The visuals and story chunks were vintage SWTOR, and Inferno played like a little love letter to SWTOR’s most passionate players who have long been pining for new multiplayer content. Inferno is one of five planned for release on December 2nd. Five more uprisings are slated to go live in February, and the level of challenge, story snippets, and variety of experience should more than address player concerns about too little elder game multiplayer content. The SWTOR team has put a lot of effort into improving the elder game and returning player experience in Knights of the Eternal Throne. Central to these efforts is the Galactic Command – a special user interface that allows players to instantly jump into uprisings and other repeatable content, then accrue command points based on their participation. These points have both individual and server-wide effects: command points unlock powerful new gear, and at the server-level, help tip the balance toward the light or dark side so that, maybe just maybe, powerful named groups of Jedi and Sith will appear throughout the galaxy. These named bosses are open-world raid content in and of themselves, and will require large groups of players to defeat. Galactic Command will also enable players to replay story content. While Charles noted that the choices you make during the first playthrough are “canonical” to your character, you still may garner light side and dark side points that go towards Galactic Command totals and see different outcomes (that won’t reach beyond your current playthrough). With Galactic Command, even though you’re managing your own story, you’ll want to involve your friends as well and play the content socially as much as possible. “Even if you're ahead of one of your friends, you can still help them out,” Ben noted. “The higher the command rank you have, you're more likely to have more powerful gear. But outside of that, you can do any activity you want to do together: hunting the Dark vs. Light bosses, doing the Uprisings, repeating content. etc. And whenever you have a full group, you get bonus command points. So you're incentivized to bring a full group rather than using companions. One word I heard throughout my time at EA Redwood Shores was “recommitment.” Recommitting to BioWare storytelling, recommitting to longtime players, recommitting to the team’s vision for the game, recommitting to the new and returning player experience. The stepped-up commitment shows. While the previous expansion (Knights of the Fallen Empire) had plenty of story gristle, it may have left passionate players feeling marooned and returning players without a clear path to action. 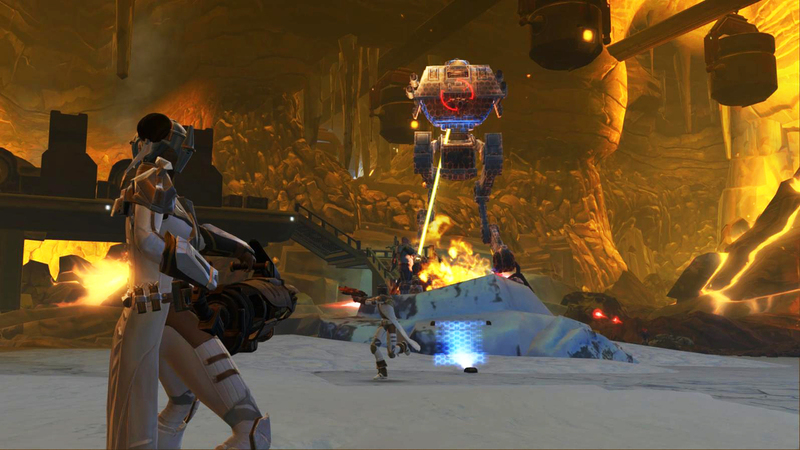 KotET offers more great story progression while addressing the needs of longtime, social, and returning players through uprisings and Galactic Command. Knights of the Eternal Throne will come to a planet near you on December 2nd, 2016. Our thanks to Charles Boyd, Ben Irving, and all the great folks at BioWare and EA Redwood Shores for showing us around the new SWTOR expansion.